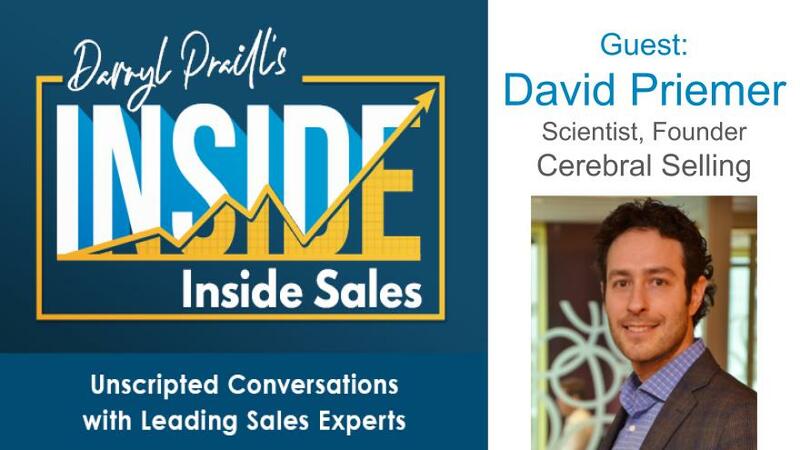 Our guest for this episode is David Priemer, an award winning scientist and the founder of Cerebral Selling. According to David, the better you are at listening, the better your chances are at making a sale. So why is it so easy to say, yet so difficult to do? We delve into this topic and provide five very easy tips to improve your listening skillset. Put your multitasking on hold, listen to the podcast, pay attention, and hit that quota! From his early days tinkering with test tubes and differential equations as an award-winning scientist to leading top performing sales teams at high growth tech start-ups, David Priemer brings a lifelong passion for uncovering the hidden insights in the world around us, to his practice as the founder of Cerebral Selling. David held several executive leadership positions at leading technology companies including Salesforce, where he was the Vice President of Commercial Sales and creator of the Sales Leadership Academy program. He is also an Adjunct Professor at the Smith School of Business at Queen's University. David holds a B.Sc. in Chemistry and Atmospheric Science from York University and a Master’s degree in Chemical Engineering from the University of Toronto. When he's not thinking about Sales, David loves to cook, write, and spend some quality family time with his wife and three girls.